We’re giving away one (1) brand new Sleeping Duck mattress. The Sleeping Duck is a 30.5 cm hybrid mattress. One grand prize winner will be randomly selected and win one (1) new Sleeping Duck mattress in their preferred size (Single, Double, European Double, King, European King, Super King) and preferred firmness (medium or firm). That winner will also win a £250 Amazon.co.uk voucher. Duration: The giveaway starts today, 1/16/17 and ends 1/31/17 at 11:59 PM UTC (GMT +00:00). Grand Prize: One (1) grand prize winner will be randomly chosen based on the pool of entries. The winner will win one (1) Sleeping Duck mattress in their preferred size and preferred firmness. Winner: One (1) grand prize winner will be randomly chosen based on the pool of entries. Winners will have 24 hours to respond by email. Non-response will result in disqualification and a new winner will be selected. Winners must provide a valid UK mailing address, email address, and phone number to be able to claim their prize. Winner will be announced via the Gleam widget, Sleepopolis.co.uk, Facebook, Twitter, and other social media. Winner’s first name, last initial, and public thumbnail picture (that’s included in Gleam) will be included in the winner’s announcement. Eligibility: UK residents only. Must be 18 or older to enter. Sponsors: The Sleeping Duck company is sponsoring this giveaway by providing both the mattress and gift card to Sleepopolis to give away. Sleeping Duck will mail all prizes directly to the winner. Sleeping Duck may email you with follow up details about their giveaway and/or their company. If you do not wish to receive these emails you may unsubscribe from communications with Sleeping Duck via an unsubscribe link included in all of their email communications. Taxes: There may be tax implications with accepting a giveaway prize. All winners are responsible for investigating if there are tax implications and to pay any and all taxes, if required. By accepting a prize you accept and acknowledge the tax implications. Sleepopolis cannot provide tax advice. Please consult with your own tax advisor. Sleeping Duck is new breed of mattress. They originally got their start in Australia, and have expanded into the UK and Germany. The Sleeping Duck is a hybrid mattress, built from thick layers of foam on top of pocketed coils. This combination creates a mattress with excellent pressure relief, contour, and hug, while still having the classic benefits of support, cooling, edge support, and bounce from the coil base. Sleeping Duck is available in both a medium and firm version. Check out my full Sleeping Duck mattress review or check out SleepingDuck.co.uk for more information. With luck, I will win with The Duck! It would be a blessing! Wishing Everyone much luck. Looks like an incredibly comfortable mattress. Need a new mattress for my aching back….come on Sleeping Duck!! …( Entered Liking and Sharing. Good Luck Every one. Thank You for the Chance! )…. Sounds a fantastic mattress. 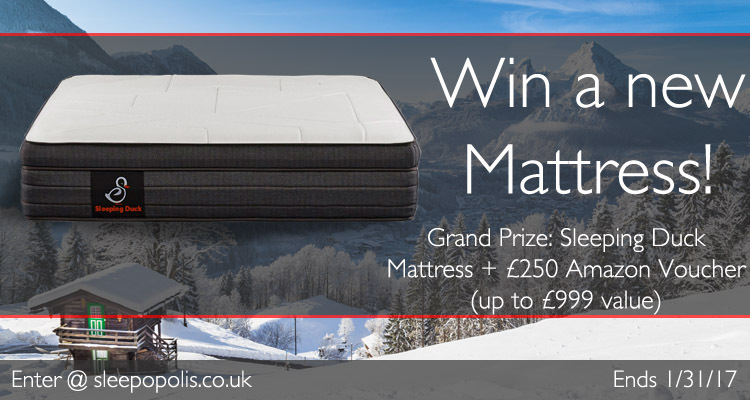 Would love to win this for my wonderful sister who suffers with a bad back and desperately needs a new mattress. I would love to have your mattress. Cause at the moment I sleep on the sofa due to illness fibrosis cant find a mattress I get on with. Fingers crossed.